I could go with the simple answer here and tell you that it’s October, you haven’t touched your skis since April, so your skis (or board, I don’t judge) could use some love. While that probably applies to 95% of you, we know that it’s not realistic to get a tune every time you could use a tune. If you only allocate one or two tune-ups per season, here are some helpful pointers on how to tell if you need some work or can wait for a few more ski days. #1) Inspect clearly visible damage: This applies to all parts of your equipment. Look for any damage from impact on your top skin, bases, edges, and tip/tail. Specifically, you are trying to identify if there is any opening that’s been exposed from a cut, impact, or separation and would allow moisture to work it’s way underneath. This can, nay, will get worse over time if left unattended. 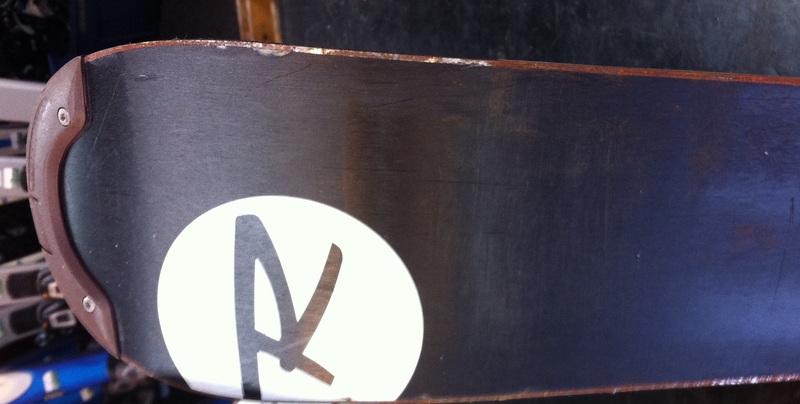 If you find any cracks or holes on any part of your board or ski, stop right here. You’re done with inspection and you need to bring your gear in for an epoxy repair to re-seal the damaged area. #2) Inspect edges for rust build-up: There are a lot of misconceptions about ski maintenance out there, among my [least] favorites is the notion that you can just “ski off your rust.” Sometimes this is true; but more often than not, if you’ve noticed rust, it’s beyond “skiing it off.” Here’s the difference you can look for: rust you can ski off looks only like a rust colored water spot on your metal edge. You can still see metal underneath it and could get most of it off with a rag if you tried scrubbing it. Any more rust than that falls under “needing attention” at the very least. If you can see any rust build-up and it has a granulated feel when you run your finger over it, you need to ski a ski-doctor at Crystal’s right away. #3) Is the base too dry? : There are two key indicators that will give you an idea one way or the other when it comes to deciding if you could use a grind and wax. First, is there a white film or surface color that almost resembles dry skin? This will be easier to distinguish on dark or black base colors, but still exists on clear or white bases. This is the result of carbon leaving the base of your ski or board while gliding across snow. The generally colder and harder snow grains that we get in Colorado exacerbates this problem. Second, while looking closely at the profile of your equipment, you may see little fibers or ‘hairs’ sticking up. You can also feel this really easily if you run your hand back and forth across the base material. If either the white color or the hairy texture exists, you’re going to suffer in the long run without a grind and thorough waxing. #4) Binding Safety: This probably shouldn’t be as low as number four on the list, but it has less to do with tuning for performance and durability of your equipment, and more to do with your personal safety and the amount of risk you are willing to undertake. I’ll start off with what should be fairly common sense: if you’ve done and/or can see damage to your binding, you need to have one of our certified professionals look at it. You likely will need a part replacement or full set replacement if this is the case. Beyond that, manufacturers recommend you get a binding check performed on your equipment about every 6 days of skiing or after any crash that resulted in an ejection. I know that sounds like a lot, but that’s where you have to make your decision on how worried you want to be about your bindings and the connected body parts. The professional in me would tell you to get it done early and often. If you have gotten all the way through this list without finding any of the cues that you need a tune-up, you’ve either done a good job storing your equipment for the summer or a poor job inspecting it. If it’s the former, go enjoy your early season days and come back to see us once you’ve put some of those early season scratches in your base. That way you can have them in near-mint condition for the peak of the season, when you’d be able to enjoy a perfectly tuned ski on the best snow conditions possible. Thanks for reading this edition of “Word from your Tuners.” We’re looking forward to seeing you (and your skis) soon. ← Who says you don’t have friends on a Powder Day!? !